The moving van is well and truly on its way to Groote Eylandt . 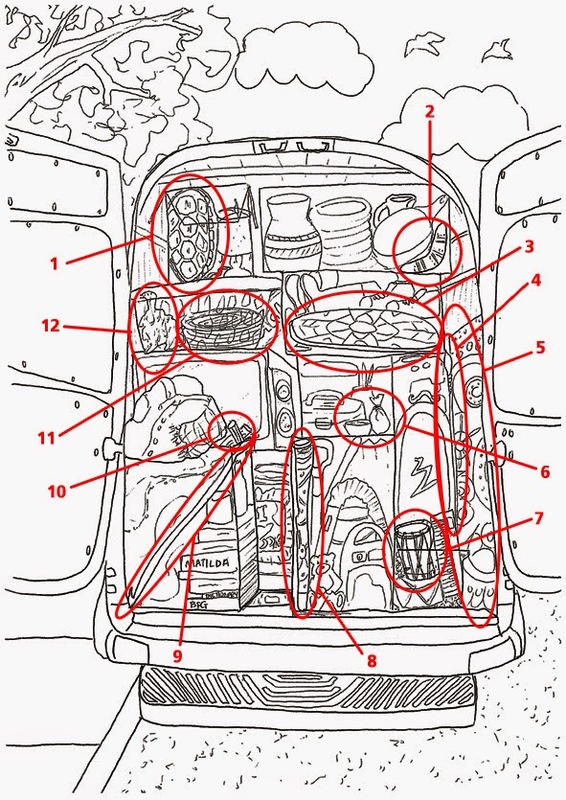 Can you find and name the Indigenous artifacts packed amongst our belongings? 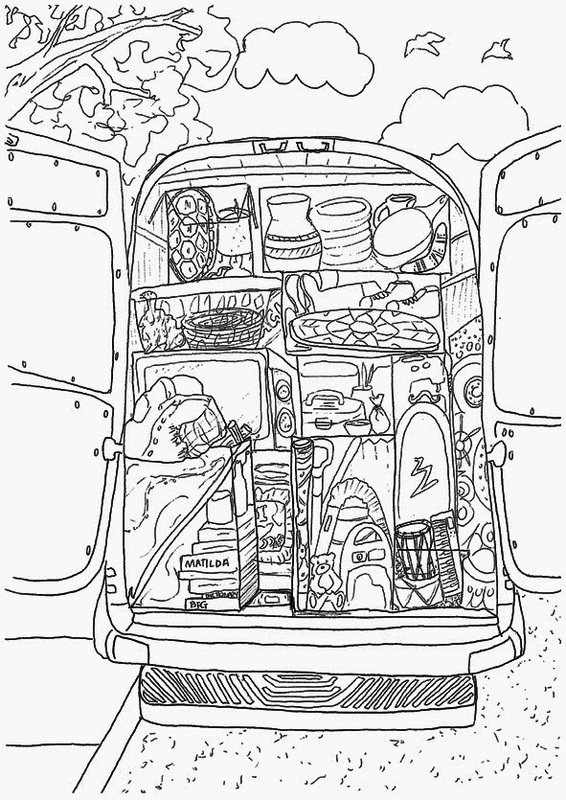 Hint: there are 12 objects to find! WARNING: The answer sheet is just below the activity sheet. Could you find all 12? Check your answers below and find out the significance of each artifact to Indigenous culture. 1. Turtle Shell – Turtles are a traditional food source for Indigenous people. The meat is cooked over hot coals and other parts of the turtle are turned into combs, spoons and fishing hooks. Turtles are usually hunted with a spear from a canoe or small boat. The turtle egg is also eaten and is said to be very nutritious. 2. Boomerang – A carved wooden object mainly used as a weapon for hunting. The boomerang has a curved design so that when thrown correctly, will return itself to the thrower. When used in this way, it is usually for recreational purposes (for fun & games). It can also be used as clapsticks to create musical rhymes. 3. Shield – Carved for use in ceremonies, dances and defensive combat. Large broad shields were used to protect the holder from spears and other missiles during battle. Shields can be left natural or be painted with clan designs. 4. Spear – Hunting spears are usually made from vine. The vine is heated over the fire to dry out its moisture and allow for shaping. A hard, jagged object is then attached to one end to create a sharp weapon. A carved stone or animal sinew is often used for the tip. The spear is usually around 1.7 metres long. 5. Traditional Dot Painting – Indigenous artists use dots and lines to tell ‘dreaming’ stories and convey messages to one another. Many traditional dot paintings are created on flattened, dry tree bark or used to decorate wooden instruments and tools. 6. Ochre Paint – Indigenous artists and those attending ceremonies traditionally use Ochre paint to create art or paint their bodies for dances and celebrations. Ochre paint is a mixture of ground-up rock and some form of liquid (water, egg, saliva or animal fat). Berries and plants are then added to change the colour. This is why the paintings have lots of earthy tones such as red, yellow, brown and black. 7. Possum Skin Drum – Dried possum skins were stretched over a hollow log to create a drum for ceremonial use. They were traditionally made by women of clans in Victoria. 8. Didgeridoo – The didgeridoo is a musical instrument made from the stump of a hollow tree. It is cut and shaped using an axe and knife. Bees’ wax is melted to one end to create a soft mouth piece. The player blows into the hole whilst using circular breathing (a difficult technique involving constantly blowing outwards) to keep producing sound. 9. Woomera – A woomera can be used to launch a spear. The spear is placed on the hook-like end whilst the thrower grips the other. It helps launch the spear with extra force and gain greater momentum, causing the spear to go much further and faster. This increases the throwers rate of accuracy and success towards hitting the target. The woomera also functions as a cutting and sharpening tool when a sharp rock is attached to the end. 10. Clapsticks – Solid wooden sticks used to create a beat for song and dance. 11. Coiled Bowl – Women make coiled bowls and baskets out of dried reeds and grasses. They use tree roots to colour the grasses, allowing them to create various designs and patterns. The coils are weaved together so tightly, the products are strong and hard-wearing. Woven products are still produced and sold in various Indigenous communities throughout Australia. 12. Possum Skin – Possum skins were traditionally used to make cloaks in the South-eastern part of Australia (due to the cooler climate). The fur of the possum would provide warmth, whilst the outer skin would act like a water-proof jacket. The cloaks were used during healing ceremonies and often Indigenous people were buried with them; which is why there are very few cloaks remaining today. An original cloak can be viewed in Museum Victoria’s permanent collection.